The 2009, year started with Marissa in Middle School and Logan and Reagan in Elementary School. The year ended with Marissa in High School, Logan in Middle School and Reagan still in Elementary. That has been a very big change indeed! In the world of soccer, there was an equal amount of change. Marissa (14), started the year playing select soccer with Sting 95 White. She and Fran had become increasingly frustrated with some aspects of that team. Starting in June, when select players become “free agents”, (select players sign a 1 year contract to play with a club), Marissa tried out with a Dallas Texans Team, and also with TFC (Texas Football Club) 95 Blue. She really liked the TFC team, and when they committed a spot to her, she took it. She has been a starter for TFC and more often than not, is playing 100% of the game (usually 80 min). As I mentioned, Miss Marissa is now attending Williams High School. This fall she tried out for the Plano East Sr. High Soccer team. She is bussed from her High school to the Sr. High School at the end of each day for soccer practice. She had a bit of a setback when she was diagnosed with a stress fracture in her foot. The stress fracture kept her out of action for about three weeks. She was able to battle back and in December she was notified that she had won a spot on the JV roster! Logan (11), also started the year with the Sting 99 Blue team. July 1, 2009, marked the date that the players Logan's age (the so-called 99s), join their first select teams. Logan had been with Sting for a year and a half, but in May she started to play some games and do training with the Solar 99 Gold team, which is the team that she eventually signed for the select year. After committing to Solar, Logan was named a captain on her team as well. Logan has really enjoyed playing with Solar, and in early December they fought their way to the finals in the TFC Blue Cup tournament. Logan has also been in the process of trying out for the Olympic Development Team for the N. Texas Soccer Association. Reagan, (9), started the year playing soccer at Sting, just like her sisters. Last spring she decided to put more focus on Gymnastics. 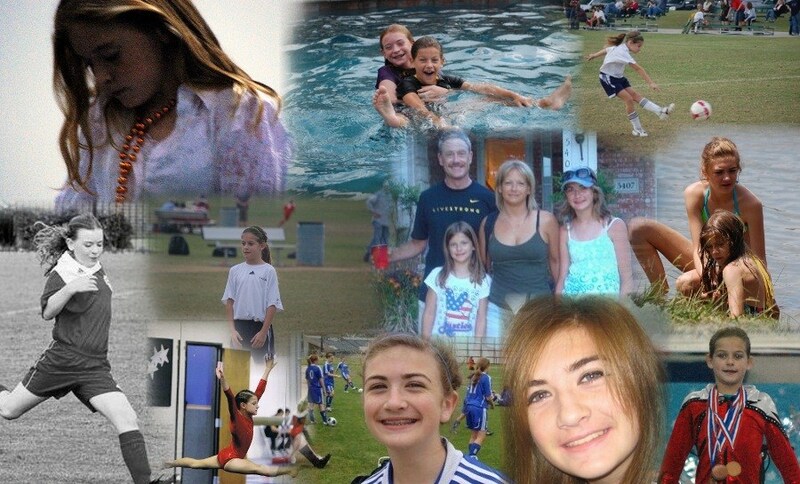 But during the summer, she hooked up with some of her Gymnastics buddies to play indoor Rec soccer. That group continued to play together this fall, and went on to win the PSA 4th grade league! That was the second PSA league win for Reagan, as she won the 3rd grade league two years ago with her Plano United team! More important for Reagan is her Gymnastics. She started the year with the University of Gymnastics Competitive team where she had been enrolled since she was three years old. During the last year, they went through three coaches, and when the last one left - that was it for the team. Reagan then joined up with several of her Gym buddies over at a brand new gym called Elite Champion Gymnastics. And that was an amazing move folks, because those girls have either won or have been runners up in every meet that they competed. Reagan won the All Around Championship at the Infinite Bounds meet. 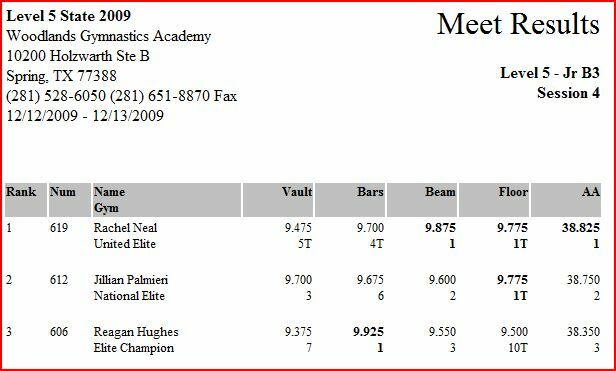 And then she went on to win the State Championship in Bars (with a 9.925) and won Bronze on the Beam and Bronze All Around at the Texas State meet. Reagan works out about 15 hours per week at the gym, and it’s a non- stop workout from beginning to the end. Chris has been doing his usual Triathlon, Track and Road Racing Routine. Chris won First Overall Masters Finisher in two triathlons (Prairieman, and Stonebridge Ranch – (which was also a State Championship), a Duathlon, and Two Road Races. Chris won his age group in the other two races that he ran with the exception of the McKinney Triathlon where Chris got a flat tire! Chris has had a crazy year at work as well. In July Chris' boss left the company and Chris was appointed Acting Director for the team (45 staff members) on a "temporary" basis. As the year is closing, Chris is still the Acting Director for the foreseeable future! In October the Company acquired one of our competitors. Chris worked on the acquisition team, which required three trips to London and one trip to India. Exhausting. Fran is the backbone of operation, shuttling the kids to and from school and then taking Marissa to TFC practice, Logan to Solar practice and Reagan to ECG practice. It’s tiring just thinking about it. Fran's Dad has had three surgeries in November which resulted in Fran leaving town to take care of him for a few days. And that put Chris in charge of the bus schedule, (with a detailed itinerary), which may or may not have run smoothly in her absence. November opened with the DRC 5K race. I was still pretty much splattered from my trip to India, but I gutted it out and won my age group. But things did not get better during November! Week 46 I came down with a cold and I needed to take a few days off as I was flying to England the following week; it was important to not get on that plane in a weakened immune system state! I survived England and came back and ran the annual thanksgiving race. My time was a bit better compared to the DRC race, but not nearly as good as last year. Travel was really taking its toll on my fall racing! The week started out well with a nice set of intervals at Carpenter Park and a good swim on Tuesday. Frans dad was in the hospital and was scheduled for surgery. That left me at home with the kids Wednesday through Friday. Yikes! Wednesday I wanted to run 3x1000 on the track in preparation for the Winter Run. That was not going to happen. Instead I had enough time after my morning calls to do a simulation in the park. I got in two strong loops around the pond. Friday I was able to sneak to the pool for a good swim. Saturday Reagan and I ran the Penguin Run and we both won Penguins! A great morning! And Sunday I got some bike miles on the stupid lifecycle. 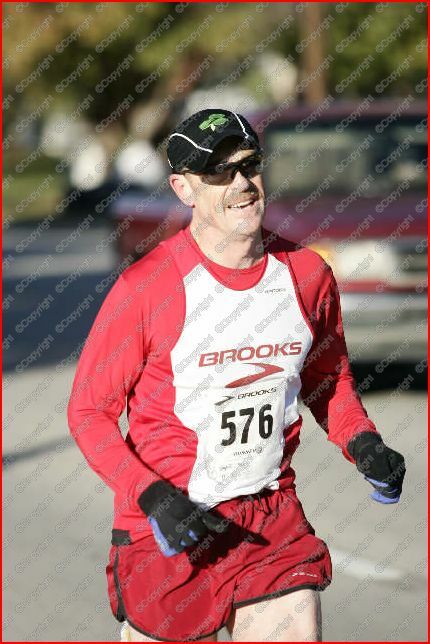 Wednesday Dec 2: Breckinridge Park 56 min run with strides and two loops of the pond all out (simulate 2x1000). 8 mile run. Thursday Dec 3: 51 min run, easy. 6.5 miles run. 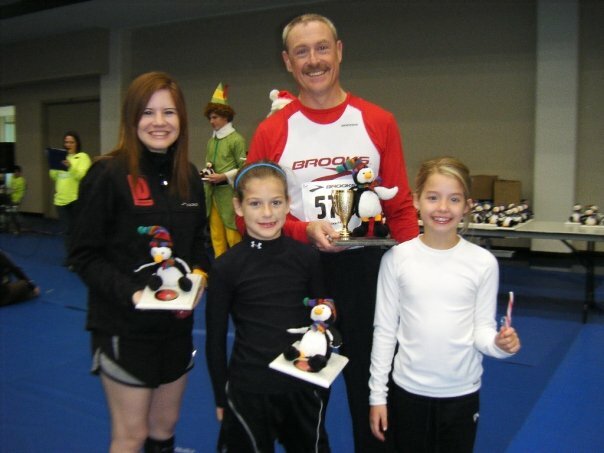 Saturday Dec 5: Penguin Run 2mi race. 7 miles run. A while back I had asked Reagan if she was going to the Winter Run with me again like we had done last year. The answer was an unequivocal "no". But then she found out that he buddy Sara from the gym was going to run it, so she agreed to run this year. My buddy McGehee was also running the race and we gave him a ride to the event. It was 26 degrees with a strong south wind too boot. That is about as cold as it gets in North Texas. McGehee and I did our usual 2 mile warm up and some strides. I collected Reagan and we all went to the start line. I took an inside position and ran by a bunch of the kids at the start. I saw McGehee line up on the outside, but I never saw him in the race. I had a pretty good pace going by the time we took the turn into the wind. I hit the mile in 5:45, which is a bit slower than I expected, but given the wind, that was probably reasonable. I was running in a pack with two other guys. Both looked old enough to be Masters runners. They were dialing up the pressure after the mile mark, so I dug in to hang with them. I managed to keep with this group most of the way in. About a quarter mile from the finish one guy made his move. I picked it up, but did not have enough to stay with him. But I had way more than enough to stay in front of the other guy. I finished in 11:30. Perfectly even splits. I jogged back along the course and found Reagan, running solo. Not as hard as last year. She kept looking back for Sara, and I kept telling her to focus on a strong finish! She came through in 19:05, a minute slower than last year. Probably due to staying with her friend for longer than she should have. It turns out that the guy who out kicked me at the finish was 39, and so I won first overall masters! Reagan edged out her buddy Sarah for third in their age group. McGehee won second in his Age group. I also ran into another Brooks Sponsored Runner, Cheryl, at the race. She also won second in her age group. So it was a good haul! Penguins! From the left: Cheryl, Reagan, Chris, and Sara. Congratulations to Reagan - Newly crowned Texas State Level 5 Gymnastics Champion on Bars! And Bronze medals for Beam and All Around as well. Awesome!